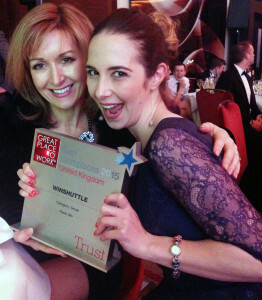 Wimbledon, UK – May 15, 2015 – Winshuttle is pleased to announce that it has been recognized as one of the UK’s best workplaces by the Great Place to Work® Institute. For the 2nd year in a row, Winshuttle has ranked among the top 10 in the UK’s Small Business category, coming in 8th place this year. This award reflects Winshuttle’s dedication to foster a culture of respect and innovation, to support and empower employees’ ambitions. Each year, the Great Place to Work Institute recognizes leading businesses in over 45 countries, based on research from millions of employee surveys. Companies are evaluated and selected based on an employee survey (Trust Index) and management survey (Culture Audit). Winshuttle’s selection signifies their outstanding employee satisfaction. “We are pleased to once again receive the 2015 Great Place to Work award, as it illustrates our passion and continued support for our employees, and our commitment as an organization to create an inviting, fun and invigorating place to work,” said Mark Hallam, Winshuttle’s Vice President of EMEA.